The default file browser of the Windows operating system, Windows Explorer (or File Explorer if you are using Windows 8 or newer), supports several display formats for files. I prefer the details view most of the time as it highlights more than just a name and an icon. Sometimes however, it is nice to display thumbnails of files directly in the file manager as it may help with recognition. Some file types are displayed as previews automatically if you select a supporting view mode while others are only shown with default icons and no preview image. Most images are for instance displayed as previews if you pick extra large, large or medium icons from the view options. Videos on the other hand are usually shown using default icons and there is little that you can do about it using built-in functionality of the operating system. Icaros is a free program for all recent versions of Windows that adds thumbnail support to Windows for several popular video formats. The program uses Windows Shell extensions to add the functionality, and ships with 32-bit and 64-bit shell extensions support. All supported video formats are displayed by it on first run, and it is up to you to keep the default selection (which means all file types are registered) or customize the selection instead. For instance, if you only want mkv files to be displayed with thumbnails in Windows Explorer, you can make that selection using the configuration menu. The free program supports the following file types currently out of the box: mkv, mk3d, avi, webm, ogm, ogv, flv, rm, rmvb, xvid, divx, flac, ogg, opus, ape, mpc, mka, ofr, ofs, spx, tak, tta, wav, wv. The file types box at the top is editable, which means that you can add other file types to it. As long s ffmpeg supports it, it is compatible with Icaros and should work just like the other files listed by the program. To enable the functionality, click on activate Icaros in the program interface after you have made the selection. Before you do, you may select the thumbnail offset as well. It determines the video position the thumbnail is taken from. A click on advanced displays additional options. You may enable the use of cover art for thumbnails there for example, enable the 32-bit Icaros on 64-bit Windows versions, or enable black and white frame detection. Icaros is a handy program for Windows that works well out of the box. If you use Windows Explorer to browse videos on your computer, you may find it a useful addition as it may improve the selection process for you. I’m using K-Lite Codec Pack and Icaros gizmo is bundled for ages now – works perfectly. I never had any troubles with thumbnails or either codecs itself. And: do you really watch FMA Martin :o? I like anime a lot, well, some of it at the very least. My taste in movies and TV shows is rather special I’d say and I don’t have any boundaries when it comes to genres. If it is good, I watch it regardless of whether it is for adults or children. This software is just indispensable. Just like SageThumbs to get pictures thumbnails for any kind of picture. I have tried looking for a tool that displays at least resolution (frame width and frame height; just like Windows Explorer in detailed view) for MKV files… and i don’t get any tool… any suggestions Martin? Does this tool add functionality or replaces the current system for thumbnail preview altogether? 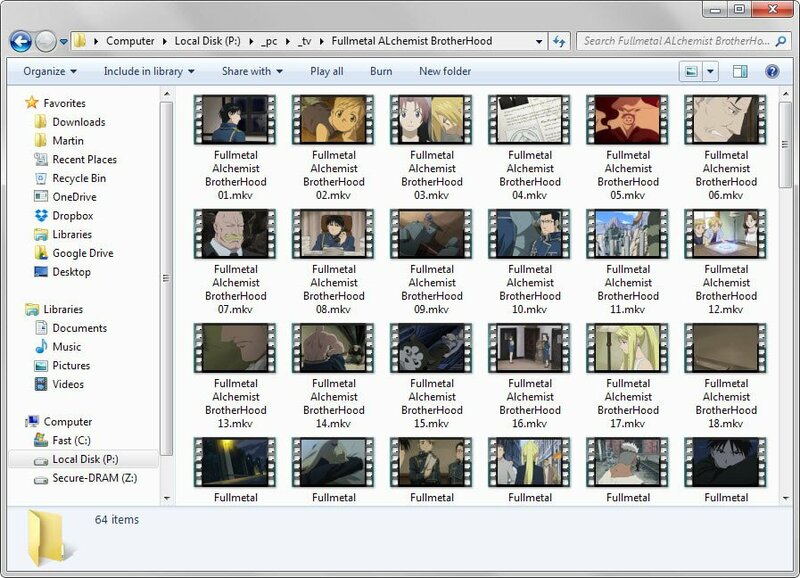 For example, I have almost all the thumbnails previews I need except for XviD/DivX videos. I’d like to use this tool to add the XviD thumbnails preview but if I only check that format within this tool, will it disable all the other formats (having them unchecked since they already work) that are already visible and working? What good is video thumbnail if all they do is to show a single frame. That’s hardly helpful even if somehow is the perfect frame to show. Haven’t these windows people seen any porrn websites these thumbnails need to be little ANIMATED GIFS with around 10 or so frames to be useful.